ANAHEIM, CA - (June 25, 2015) - The Anaheim City Council is expected to consider an entertainment tax policy for the Disneyland Resort at its July 7 meeting as Walt Disney Parks and Resorts evaluates a significant investment in its existing operations in the Anaheim Resort. The policy, to be presented as a proposed resolution and agreement with Disney, is set to be considered during the Council’s regular session starting at about 5:30 p.m.
Disney is evaluating the addition of new attractions that would drive attendance and longer stays at the Anaheim Resort. Should the expansion occur, it would fall within the existing footprint of the Disneyland Resort and come under entitlements approved in 1996. The company also is considering significant infrastructure improvements that would have a direct, positive impact on circulation and traffic flow along Harbor Boulevard and Ball Road. A potential investment could be valued at $1 billion. If Disney decides to move forward, it would have until Dec. 31, 2024, to complete its investment under the proposed agreement. The expansion under consideration requires no City funding or bond financing. The resolution going before the Council extends a nearly 20-year agreement with Disney regarding entertainment tax policy. The existing agreement was put in place in 1996 and runs through 2016. The City’s current entertainment tax policy has provided Disney the confidence to undertake significant investment in the Anaheim Resort, including the opening of Disney California Adventure Park, Disney’s Grand Californian Hotel & Spa and the Downtown Disney District in 2001 and the addition of Cars Land to California Adventure in 2012. A new entertainment tax policy would run for 30 years with the possibility of a 15-year extension based on additional, substantial investment by Disney beyond $1 billion. The policy would allow for reimbursement to Disney in the event an entertainment tax is enacted. There are no proposals for an entertainment tax by the City of Anaheim, and any proposed tax would be subject to voter approval. The Council is considering a new entertainment tax policy in recognition of the important role Disney and the Anaheim Resort play in providing essential services for residents, businesses and visitors. At 4 percent of Anaheim’s total acreage, the Anaheim Resort provides more than 50 percent of gross General Fund revenue — $148 million annually from hotel, sales, property and business license taxes, according to City’s 2015-16 budget. After factoring in the cost of providing City services, the Anaheim Resort generates $67 million in surplus revenue annually, or nearly a quarter of Anaheim’s General Fund. Surplus revenue from the Anaheim Resort is equal to 55 percent of the Anaheim Police Department’s General Fund allocation, 100 percent of that of Anaheim Fire & Rescue and more than triple that of the Public Works Department. Since Anaheim and Disney partnered to expand the Anaheim Resort in the late 1990s, the City’s revenue from hotel stays has nearly tripled to a budgeted $133 million for 2015-16. “This proposed entertainment tax policy is a pragmatic way to facilitate investment and future revenue for City services,” Interim City Manager Emery said. A potential $1 billion investment could result in nearly $600 million in additional hotel, sales and property tax revenue to the City over the next 40 years, according to KPMG study for Disney that was independently reviewed for the City by Beacon Economics. Current revenue from the Anaheim Resort is evenly spread across the City. On average, the City spends $660 per resident each year, ranging from $638 per person in East Anaheim to $677 in the central and south areas. Under the 2015-16 budget, the City Council is targeting four areas in particular to benefit from funding provided in large part by the Anaheim Resort. They are Downtown Anaheim, Beach Boulevard and West Anaheim, the Canyon and the Anaheim Resort itself. Additional revenue generation by the Anaheim Resort also supports the City’s debt management and reduction, which enhances Anaheim’s already strong financial standing and frees General Fund revenue for essential services. The Anaheim Resort plays an important role in Anaheim’s economy. 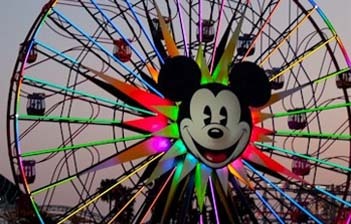 More than 5,000 of the Disneyland Resort’s 28,000 workers are Anaheim residents. A potential $1 billion expansion could create an additional 2,600 jobs in and around the Anaheim Resort with city residents filling many of those. During a potential development phase, approximately 3,700 construction-related jobs could be created.